New website rollout!!! Please take the time to look around at our new website. Welcome to the official California Cowboys Web Site, where you'll find the latest info on the band, schedule of live shows and be able to purchase one of our albums. The Cowboys are also on Twitter, Facebook, and Instagram @ #CCboys, click links to follow. Here what people are saying! What are people saying about the California Cowboys? The San Francisco Examiner offers this commendation, "even though they can knock-out Top 40 crowd pleasers with a technical mastery that rivals the original recordings. The majority of their music is original... and those are the songs the crowds prefer!" Being great crowd pleasers has helped the Cowboys become two-time winners of the Marlboro Country Music Talent Roundup and champions of the Dixon Country music shootout. With the honor of becoming KRAK radio's band of the year. You'll soon be able to hear their music on many top country radio stations. R.W. 's creative combination of rock influences with traditional country sound and look has won him the honored position of CCMA's Entertainer of the Year 1994. Country Music Magazine dubs the Cowboys an "Unusually Terrific Band that not only loves country music but has the ability to write it, play it and hold an audience in the palm of it's hand." Lori Umpress of Tony LaRussa's Animal Rescue Foundation says "the Cowboys are not only a pleasure to work with, but the way they capture an audience is magical." The Reno Best Bets Magazine calls the Cowboys "Best unknown band of the year, with big star potential." California Country Music Awards says "Entertainment just doesn't get any better than this." The Bed Rock Awards voted the Cowboys "Best Club Band of the Year." Winners of Disc Makers 25,000 Independent Music World Series. Winners of the Mama Awards (Modesto Area Music Awards) best in country, 2002. R. W. Smith and the California Cowboys deliver a powerful sound, with the clear punch of tight three-part harmonies. And such rowdy, foot stompin' original songs as "We Ride' em We Rope' em" and "Double Shot of Hank", it's easy to see this band will always go over in a big way with any audience. As lead singer and song-writer, R.W. is the polished showman. He dances and jokes with the audience while delivering top billing entertainment. Together with drummer Hal Atkinson (CCMA’s Drummer of the year, 1994), guitar player Gary Potterton ( producer of "Grandma got run over by a Reindeer". bass player, Cary Atkinson and legendary Steel Guitarist, Bobby Black. 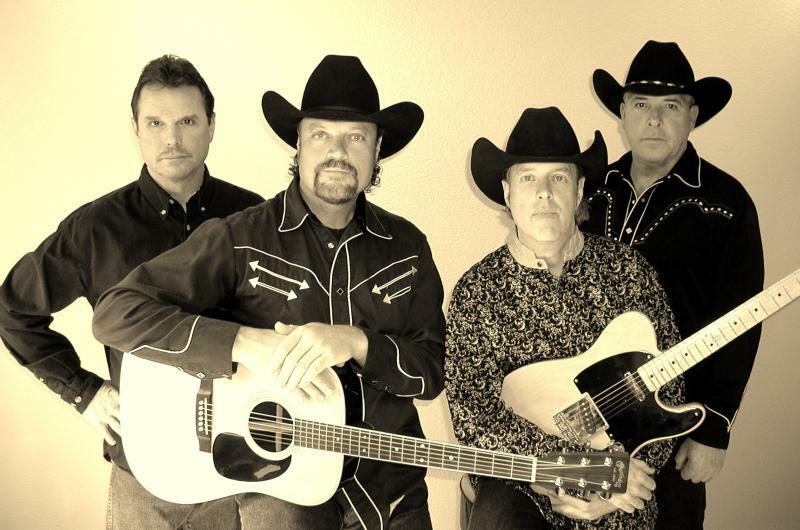 These fine musicians form one of California's most successful country-western bands. With a solid draw and non-stop show, promoters and sponsors know the Cowboys can fill the seats with cheering audiences. The Cowboys have appeared on concert billings with such country favorites as Alabama, The Judds, Dwight Yoakam, Merle Haggard, Ronnie Milsap, George Jones, Joe Diffe, Willie Nelson, Waylon Jennings, The Bellamy Brothers, Pam Tillis, Travis Tritt, Doug Stone, Alan Jackson, George Strait, and many other country stars. They have appeared frequently at many of Nevada's top casino's, including Harvey's South Lake Tahoe, The Peppermill & John Asquaga's Nugget. They have also appeared at many of California's largest fairs, Cal Expo (Sacramento), the Sonoma-Marin County fair & the Stanislaus county fair, to name a few. No strangers to large crowds, the Cowboys have performed at AT&T Park, the Oakland Coliseum, the Cow Palace, the Shoreline Amphitheater, the Concord Pavilion, and the Gilroy Garlic Festival. If you have a special event, the Cowboys can help make it a successful & memorable one! Copyright 2013 California Cowboys. All rights reserved.